4. Heat greased griddle. Cook muffins on griddle about 10 minutes on each side on medium heat. Keep baked muffins in a warm oven until all have been cooked. Allow to cool and place in plastic bags for storage. Split and toast. 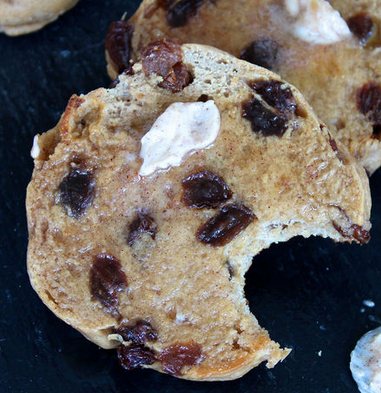 Great with butter, or cream cheese and jam. This is going to be a very soft dough, so you’ll need to treat it a bit differently than most yeast doughs. If you have a stand mixer, beat the dough using the flat beater paddle until it starts coming away from the sides of the bowl, and is satin-smooth and shiny; this will take about 5 minutes at medium-high speed. When you lift up the beater, the dough will be very stretchy. If you have a bread machine, simply use the dough cycle. Scrape the dough into a rough ball, and cover the bowl. Let the dough rise until it’s nice and puff (1-2 hours). Next, prepare your griddle. Whatever you use – an electric griddle, stovetop griddle, frying pan, electric frying pan – sprinkle it heavily with semolina or farina (e.g., Cream of Wheat), which will give the muffins their signature crunchy crust. If you’re using a griddle or frying pan that’s not well-seasoned (or non-stick), spray with non-stick vegetable oil spray first, before adding the semolina or farina. You’ll need to cook the muffins in shifts. Divide the dough into 16 pieces. Shape each piece into a smooth ball, then flatten the balls until they’re about 3″ to 3 1/2″ in diameter. Sprinkle the tops of the muffins with additional semolina or farina. Cover the muffins (a piece of parchment works well), and let them rest for 20 minutes. They won’t rise like crazy, but will puff a bit. To cook the muffins, you'll need to find the exact amount of heat that’ll cook the muffins all the way through and brown them perfectly – simultaneously. Cooking the muffins for about 15 minutes per side over VERY low heat usually works well. If you find your muffins are browning too quickly, turn the heat down. If they’re already as brown as you like, but still not cooked through, don’t panic; you’ll be able to finish them off in the oven. Within a few minutes of when you’ve begun to cook the muffins, they’ll start to puff dramatically. You want English muffins, not dinner rolls, so weigh them down gently to prevent further rising. A piece of parchment atop the muffins, and a baking sheet atop the parchment, works perfectly. If they run into one another as they rise, simply use a sharp knife to gently cut them apart and separate them. You might notice that the farina/semolina burned on the pan, but not on the muffins! Check the inside of the muffin. If the edges look good, full of nooks and crannies but the center is a bit doughy, Into the oven they go – 350°F for about 10 minutes should do it. You want the muffins’ centers to register right around 200°F on your digital thermometer. Let the muffins cool thoroughly before enjoying. And remember: use an English Muffin Splitting Tool, not a knife to cut them. You want to preserve the wonderful nooks and crannies. Knife-cut muffins won’t have those. While the interior of an oven-baked English muffin isn't filled with the signature fissures of a griddle-baked English muffin, their texture is still craggy enough to trap and hold butter and jam. Yum! *Or substitute 1/4 cup (1 1/4 ounces) Bakers' Special Dry Milk, and 1 cup + 2 tablespoons (9 ounces) lukewarm water; don't mix them together, the dry milk doesn't reconstitute. Yields 12 baked English muffins. 125 calories per muffin. Stir together all the ingredients except the semolina or cornmeal. Beat for 1 minute at high speed of an electric mixer; the dough will become somewhat smooth. Scrape the dough into the center of the bowl, cover, and allow it to rise for about 60 minutes, until it's quite puffy. Grease a large (18" x 13") baking sheet; or line with parchment. Grease twelve 3 ¾" English muffin rings, and place them on the baking sheet. Sprinkle semolina or cornmeal into each ring. Turn the dough onto a lightly greased or floured work surface. Cut it into 12 equal pieces; each will weigh a scant 2 ounces. Shape the dough into balls. Place each ball into a ring, pressing it down to flatten somewhat. Sprinkle with a bit more cornmeal or semolina, and top with a greased baking sheet (or a sheet of parchment, then the baking sheet). The baking sheet should be resting atop the rings. Let the muffins rise for about 60 to 90 minutes, until they've puffed up noticeably. While the dough is rising, preheat the oven to 400°F. Bake the risen muffins for 10 minutes. Flip the pans over, and bake for 5 minutes more. Remove the top pan, and bake for an additional 3 to 5 minutes, until they're a light golden brown, and the interior of one registers about 200°F on an instant-read thermometer. Remove the muffins from the oven, and transfer to a rack to cool. Remove rings as soon as you're able. When completely cool, store muffins in a plastic bag. Split when ready to eat. Heat the water in a small microwavable bowl on high heat for 1 minute. Let rest a few minute before stirring in the yeast and 1 tablespoon sugar. Let proof for 10 minutes. In another small microwavable bowl, heat the milk on high heat for 1 minute. Set aside. Melt the butter in another small bowl. In the bowl of an electric mixer fitted with the whisk attachment, whisk together the flour, cinnamon and salt. Switch to the paddle attachment and while the mixer is on low speed, add the melted butter, warm milk and yeast mixture. Mix on low speed until just combined. Add the raisins and mix another minute until they're dispersed throughout the dough. The dough should be sticky. Remove dough to a lightly greased bowl and cover with plastic wrap. Let rise in a warm place until doubled in size, about 1 hour. Once dough has risen, press out onto a large piece of parchment paper to about 1-inch thickness. 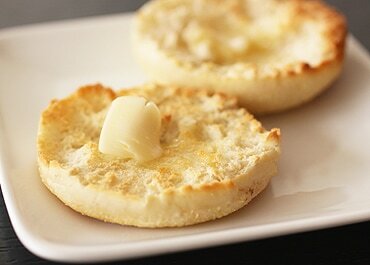 Using a biscuit cutter or top of a round glass, cut the dough into 3 1/2 inch size English muffins. Repeat pressing and cutting dough until you have 10 muffins. Heat 2 tablespoons butter in a non-stick skillet over low heat. Place 5 English muffins in the skillet at a time and cook until browned and crisp on each side and baked throughout, about 8 minutes per side. Transfer to a wire rack to cool completely. An English Muffin Splitter preserves the texture better than slicing with a knife.